There were no immediate reports of damage after the initial quake struck at 2:29pm local time. The USGS registered the depth of the quake at 10km. A second and lighter 3.4 tremor followed about 10 minutes later. It was located 20km west of Wanaka at a depth of 11km. “It gave us all a bit of a shock,” Wanaka Tourism Office general manager James Helmore told Fairfax NZ News, as shaking persisted for some 15 seconds. “There may be some minor damage in plastering” he said, but there was none he could see at that moment. Local media is also reporting evacuation at the Wanaka Puzzling World attraction park. 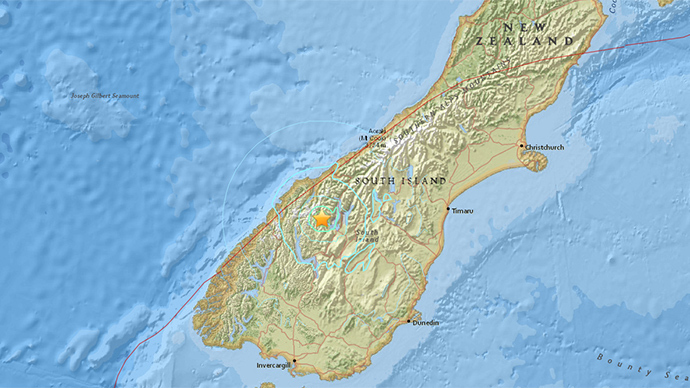 GeoNet geohazards information manager Kevin Fenaughty told Fairfax NZ News that no structural damage is expected as a result of this earthquake. Moderate shaking was also felt in Dunedin, Alexandra and Queenstown on the South Island. New Zealand partially lies on the eastern margin of the Australia plate which is one of the most seismically active areas of the world, due to the convergence of the Australia and Pacific plates.